Understand Blue: Hero Arts & MISTI May-nia! Well it might be Monday - but it's a super fun day here on my blog. You'd better fasten your seatbelt. I'm hopping with some Hero Arts friends today to launch the My Monthly Hero Kit for May, which was inspired by a campaign near and dear to my heart - my friend Jennifer's Share Handmade Kindness campaign. If I could go back and rewrite my thesis on metafiction, featuring Thomas Pynchon, I would have discussed the postal them in a different light, now knowing what I know about how much stampers LOVE to actually make mail themed cards. You know we do. My favorite obsession is airmail images. I've loved them since even before Griffin & Sabine, which I hope you've all read. If not, you are not allowed to stamp again until you do. The add-on to this month's kit is called Happy Mail and that's the one I'm playing with today for a fun, meta, clean and simple card today. As usual, if you hop along to all my friends, and leave a comment, Hero Arts will choose a lucky winner of this month's kit - you can see the full kit here. But just wait - because there's more! Did I mention this is the best month ever? 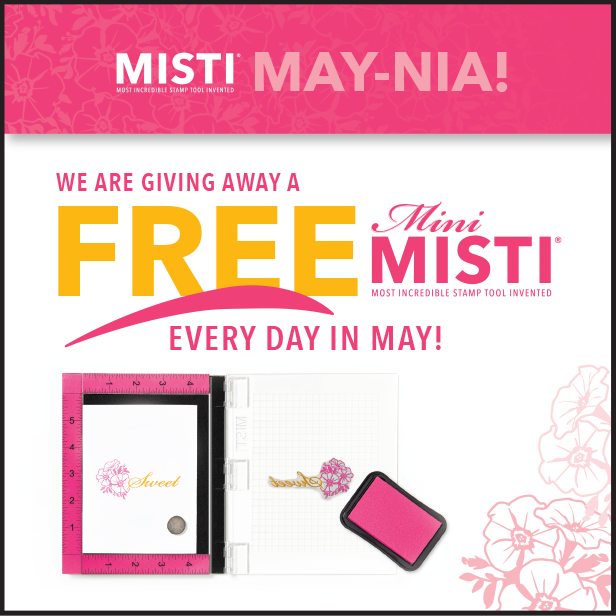 My Sweet Petunia has invited dozens of your fave bloggers to participate in MISTI May-nia - which is a daily giveaway of Mini MISTIs every day in May! Those are some good odds, my people! My friend Iliana helped kick it off yesterday, and today, I get to give one away, along with sweet & talented Virginia Lu. So what do you have to do to win? You have leave me a comment and tell me how old the oldest stamp you own is. That's it! I want to see who has the oldest stamp. Bonus points for telling me the manufacturer and the name. You know how much the MISTI has changed the stamping world. I have never been more grateful for a tool. And this generosity this month is just incredible. I'm so proud to call Iliana a friend. I can't wait for one of you to win the one from my blog. To show you how I put together the card today, I made a quick video with a few tips for using long skinny stamps like the adorable airmail stripe I used here. So take a peek and then hop over to see Virginia! Love your card! My oldest stamp is actually a small stamp set of cats from All Night Media & is 31 years old now. That's how long I have been stamping. I'd snap a pic but they are packed cuz we are moving in a few weeks. I love red rubber cuz after 31 years they still stamp fabulously! Love you CAS card! HA has some of the best kits out there! How fun, love your card! That's a lovely clean card. My oldest stamp is a four-sided foam stamp from Darice. It is called a "Leaf/Botanicals" stamp. I appreciate the video of how you made your lovely card using the Misti. At the end of the month, I had better know how to use one by then. Adorable card, thanks for sharing the video! The MISTI is a wonderful stamping tool, a must-have! I took a peek at the Hero Arts kit and I love all of the wonderful sentiments of appreciations. Thank you to Hero Arts and My Sweet Petunia for sponsoring the hops. Your card is fantastic and I love how awesome the MISTI seems to be! I don't own one and haven't tried it yet, but it seems like a must-have tool for a stamper! oh yeah...my oldest stamp is only a few months old! I'm a new stamper and my first set I bought was the Pandamonium stamp set from Mama Elephant. Love the airmail theme. It reminds me of letter we'd get as a kid when my family lived outside of the USA. I've been stamping since the late 1980's and I still have my first stamps from Hero Arts that I bought for Christmas gift tags. Your card is so CAS And perfect! LOVE how you showcased MISTI and Hero Arts monthly Card Kit, Lydia! I am so happy to be hopping along with you today! My stamps go back to 1996! Love this card! I started stamping in 2013, so my first set is from just a few years ago! Great inspiration again from Hero Arts!! Fabulous card!! Hmm I would guess my oldest stamp would be somewhere between 5 - 10 years, Last year i did a purge so Im sure a lot of super old ones went on to new homes, but i probably kept a few older ones too!! Love the card! My oldest stamp is from Studio Calico and I don't know it's name, but it's at least 12 years old! Lovely card! My first stamp set was sent to me as RAK it was by Gina K.
I have 3 basset hounds! Would love to see your stamp! Your card is delightful! The oldest stamp I own is at least 15 years old, an image designed by my talented son, and was custom made for me by a friend who used to have her own stamp company, OnyxXpressions, which is sadly no longer in business. Beautiful card! I started card making less than a year ago with a 2012 Christmas stamp set by Kaisercraft. Bought it pre-loved off another crafter and I am still using it now! This is a great CAS card, and another great use of the MISTI. Thanks so much for sharing your tips using this awesome tool. What a cool.card! My oldest stamp is one circa 2002. Just love you CAS airmail style card, Lydia! And I enjoyed your video too!! Don't know what I'd do without my MISTI, that's for sure! As to my oldest stamp, I believe it's a woodblock from 2000 by Hero Arts - it's a sentiment "Take Time to Enjoy the Simple Things"; I used it to make bookmarks. Thanks for the chance to win! Love your card. Cute idea! Love your card, it's so different and refreshing than the rest of the people participating in the MMH hop. I checked old stamps. The oldest I could find with a date is 1988 by PSX Girl Doing Embroidery. Great card! Wow, my oldest stamp is a woodblock stamp by Personal Stamp Exchange (PSX) called "Abby and Marty Happy Birthday" (from the "sugar and mice" line) and I bought it in 1999! Nice card... I'd love to win the small Misty!!!!!! Oh, I forgot... my oldest stamp is from about 2000, I have moved several times, and had to clean out... but it is a SU set of table ware! Such a cute card. My oldest stamp set is from Stamping Up. The name of the stamp set is Patchwork Angel. I love how clean and simple this card is Lydia!!! I think my oldest stamp is a set of SU from 1992, thift store and garage sale finds make everything old new again!! The card idea is so cute. Good job. That IS happy mail!! One of my oldest and dearest stamp is a set from Stampin' Up'! It's a two step poinsettia set and I cannot remember the name of it. But the poinsettia image doubles as a sunflower...love double duty! thanks for taking your precious time to share your artist talents!! I'm a newbie at card-making. I purchased my first adult stamps from Julie Nutting's doll collection. If you count youth stamps, I acquired my daughter's pre-school collection of shapes by Ready to Learn. I believe they are 6-years old. Haha. I love your card and video. My first stamp set I bought was #4251L Letters and Numbers from Mary Engelbreit--made by All night media. Can't remember how old they are but they are foam mounted and still in the original box. Really like your airmail card. How do you folks make so much with so little? It's a talent, I tell ya!. Now, my oldest stamp is about 18 years old. Is that possible? Yup. This is like my favorite comment ever. I finally feel at home in CAS cards - I struggled with what my style was for so long, and I'm happy as a minimalist now :) Sometimes they are harder than fussy cards though. I don't like clutter in real life either. I think it just took me a long time to find my happy place. Thanks for stopping by. Great use of the Misti. Super cute card. I love the simplicity of it. TFS! I saw one post said 19 years! Okay, I won't win this one! But I've been stamping for about 16 years now! My oldest stamp set is Stampin Up's Lovely as a Tree. Probably had it five years. I have an Inkadinkado stamp that is my initial (N) that my grandmother gave me in elementary school along with a stamp pad and stationary to make my own monogram stationary. I still have it... the (C) on it is 1987, and I'm pretty sure that's when I got it... so it's about 29 years old. I want a misti so bad! Thanks for the giveaway!! Who doesn't love happy mail! And who wouldn't love a Misti! My oldest stamp is a Used Asian stamp I bought It is from the 1990's I was lucky to buy several wood mounted stamps from a store who got an Asian stamp lovers estate. I love your card! Super clean and simple with fabulous colors! Love it! I'm thinking that my very first stamp I ever owned is about 36 years old, I got it when I was around 5 years old. Their is no manufacturer or stamp name on it though. Not sure if it wore off or if it never had it and the Internet is not bringing up any info either :( Such a bummer, as it would have been neat to see if that company was still is business all these years later. Holy cow...talk about amazing giveaways. Love your clever "Happy Mail" card. That little open envelope flap is stinkin' adorable with those hearts floating out of it. As for my oldest stamp...think it was 2008 wood block by Paper Inspirations called Stars. Got it at Michaels for a scrapbook page but still use it occasionally on cards. Very nice card! My oldest stamp is a Hero Arts rubber stamp on wood 1985. It doesn't have a name but it is a Things to Do List with a bear on top & dotted lines below. I use it all the time to make note pads. Ha! I wish I had a nickel for every time you have mentioned Griffin and Sabine! It would be nice if I could find it! When did you read it in the 1920s? So funny, just like you. This is some giveaway! So much fun. I, too love airmail type images. This may inspire me to get inked up. Oh darn, can't! I haven't read the book! I thought of you when I saw this kit! I think my oldest stamp is a 1998 Stampin' Up! Set called "Counting Sheep". Love your cute postal themed card! My oldest stamp... in about 1988, I purchased a Siamese cat design from a company called ANT Transfer! They were located in the San Jose, CA area, and my friend Mary picked it up for me when she visited that area! This is soooo very cute!!!! I love that little envie! Adorable! Ohhh! Ahhh! A mini MISTI!!! I am going a-hopping at both Hero arts AND MISTI!!! Virginia's talent was new to me when she was Featured Stamper on Splitcoaststampers. She is the SWEETEST! I visited her blog and she had a sweet post about FS that day. Talent and sweetness all rolled into one! My oldest stamp is a lion image from Magenta. I believe I got the stamp in 1996 or 1997. Thanks for sharing your cute Happy Mail card with us! LOve this set. My oldest stamp is stashed away somewhere in my Mom's attic. I used to buy stamps from the Paragon catalog long ago. It has to be at least 30 years old. The oldest stamp I have is a Rubber Stampede Suzy's Zoo stamp called Suzy's Birthday Banner dated 1991. This was in a box of stamps purchased by my daughter for me. The first stamp set I bought was a Stampin' Up set purchased at the first SU party I went to in 1999. It is called Angels Mini and I am using it this month for a challenge called First Stamps. Very cute card. Well my oldest set of stamps is about 7 years old from Martha Stewart. Such a great card! I think the oldest stamp in my stash is probably a bear that I from Hobby Lobby about 7 years ago. I believe it is from Stampendous. I am a first generation stamper! Thanks for the great video! I don't have any really old stamps! I have a Summer Sunflower set from Stampin' Up! from 2000. Such a cute idea. I love you idea. Thanks for participating in the hop, and for the chance to win the card kit or the Misti!!! Great card. The oldest stamp i own is probably 15 years old. Bought it when I still was in school. Can't remember the manufactor anymore though. Such a beautiful card!! Love the happy mail!! My oldest stamp is 3.5 years old, I'm relatively new to stamping. This is a really Happy card! The oldest stamp I own is from Stampin Up, January 2010. Very cute withe airmail theme and the hearts. My oldest stamp was sold by the Current company back in the 1990's I think. It was a dog and cat set. What a cute card and I love the CAS style of it. As for my oldest stamp, I have no idea which one it would be. I started stamping 16 years ago and my place of work was next to a stamp store. I think I started out with only a few at first but being a store next door sold them I soon spent a lot of my paycheck there. Such a cute card, Lydia! My oldest stamp is a House Mouse stamp. I've had it for almost 15 years. Love what you created! My oldest stamp set is 18 years old and since then my stash has grown and grown. My best friend's father used to carve his own stamps. The one I have is pretty old (maybe 40 years old). I have to go find that and use it sometime! My oldest stamp is from SU - an I Love You stamp in sign language. I think it's from 1999 or 2000. I still use it! Well that is the question right, I started making my cards in the early 80's but don't really remember the exact stamp or date. Thanks for all you do I LOVE reading your blog!!! Frosty is the oldest stamp set I own -- it was my very first SU purchase. OK - I NEED that mini Misti! I have a set of alphabet stamps that I bought used that look to be from the early 1900's! Large, wood mounted, in a carrying tray. I'm going to guess that they belonged to a school teacher or a printer. No notations on anything to tell me how old they are, nor who made them... Pick me, pick me!!! My oldest stamp is a Hero Arts wood stamp - "Congratulations". It is perfect for most occasions. My oldest stamp must be 28 years at least... it is my initials. I made cards waaaay back and found a scripty stamp of my initials. It never worked well but I liked it. I love this may kit from hero arts!!! I will be using it a lot!!! love this cute card! I love snail mail especially Happy Mail. My oldest stamp is a 1996 set called Fishin' from Stampin' Up. Boy, we have come a long way in stamping supplies since then!! Have not tried a Misti yet but may have to soon. Love the cute Hero Arts kit! I love the hearts floating into the envelpe! I have no clue how old my oldest stamp is, but I do know I've had some for atleast 5 or 6 years :) Love your card! I'm not totally sure that I can pinpoint which stamp is my oldest, but I have several paisley stamps (Hero Arts, Inkadinkado, and Stampin' Up) that are probably some of the oldest. I just can't bring myself to part with them (because paisley), but I also can't remember the last time I used them. Cute card! My oldest stamp set is probably from 2002, when I first started stamping, and was probably an SU set or a single stamp from a small Mennonite store near where I lived at the time. Fun card I would love a mini MISTI as happy mail! Adorable card. What a great kit this is, such cute images. Is that Misti the greatest idea ever or what? Thanks for the chance to win these great products. My oldest stamp is one my cousin gave me called "Hogs and Kisses" She gave it to me at least 20 yrs ago when I collected pigs, but before I ever started stamping. I still have my old sentiment stamps from the 90s when I first fell in love with stamping. My oldest stamp purchased stamp I bought in 2002 but I've since priced up some circa 1970 stamps at a used stamp sale - it is an old fashisioned sailor winking at the viewer. I am all about clean and simple white layouts, with an extra something special to make it pop! Wooden. Printworks. 1996. But I have no idea what number owner I am. Got it on ebay. this is adorable! none of my stamps are old because I am just starting out!.. I only have about 10 sets and I want MORE. This is ADDICTING!!! I am reorganizing my craft room and just went through a container of older stamps. One I found is an adorable "Happy Easter" sentiment stamp with flowers I purchased when I lived in Panama, Central America around 1993. The manufacturer is PSX from Petaluma, CA. Although this stamp is not nearly as old as others who have posted, it is a classic favorite and one that will always stay in my stash. You do such a good job with white space. I'm. It sure what my first stamp was, but my first order was from Penny Black, and I still love the stamps. My oldest (and first) stamp set is Everyday Button Bits from Papertrey Ink. I'm relatively new to this hobby, so my oldest stamp is only three years old. 14 Years :) What a cute card! What an awesome card. And a great opportunity to win amazing stuff. My oldest stamp is probably over 20 yrs old. Can I just brag that I have not purchased a store-bought card in over 18 yrs? I can't even tell you how old. I inherited a big box of stamps from an elderly woman who passed away. Her daughter said I was the only person she knew who was interested in stamping. I have no idea when her collection started, but it was way before I started. Simple but cute card! I have only been stamping for a year. My oldest stamp would be a Stampin Up set from my first card making lesson. My oldest stamp set is from Stampin Up. I went to a Stampin Up party in 2006 with a friend and was instantly hooked, so I purchased my first stamp set then. Love your card, and the tips for using the MISTI. Love the card. My oldest stamp set was originally my mothers. She bought it from Stampin up around 1996 or so. It is a pack of stamps that are about an inch in size and feature a character from every holiday. It is one of my favorite. So cute! I love the new hero arts set. That is a very cute card! I don't know how old my oldest stamp is....possible 12 years. Super cute card mf. I think my oldest stamp would be one 10 yrs maybe older...I have lost track. Love your Hero Arts card design, especially in those Airmail colours. And to be able to win a Mini Misti would be a dream come true. I only started stamping two years ago, so definitely don't think I'll be in the running for the oldest stamp I'm afraid!! Loved learning about using bumpers. My earliest stamp set is Lovely As a Tree from SU. I got mine in 2005 with my original kit, but I know it was around before then. Love the clean card! The airmail stripe is awesome! Sorry but I don't know how old is my oldest stamp lol, but I have a couple of old hand-me-downs! What a fun card! My oldest and first stamp set is "priceless" from Stampin' Up 2007. I had a co-worker who became a demonstrator and introduced me to stamping, I've been hooked ever since and haven't bought a card since 2007. Cute card. My oldest stamp is from Christmas 1990. I bought it at a craft fair, so I don't know who the manufacturer was. It was solely for stamping/decorating the envelopes of my storebought Christmas cards that year. Beautiful card! I have quite a few PSX stamps that are quite old. I believe my oldest is the Old Fashioned Rose 1994. I love your card. My oldest stamp is circa 1995. It was made by The Stamp Cabana (a "chain" stamp store that used to exist in Florida). They had several stores and this also just happens to be the first stamp store I ever visited (the Winter Park location). The stamp is my initials and to this day it's what I stamp on the back of my cards. Great question by the way! love both the hero kit and the mini-misti! great card! Love the new kit, awesome card!!! Your airmail card is gorgeous! 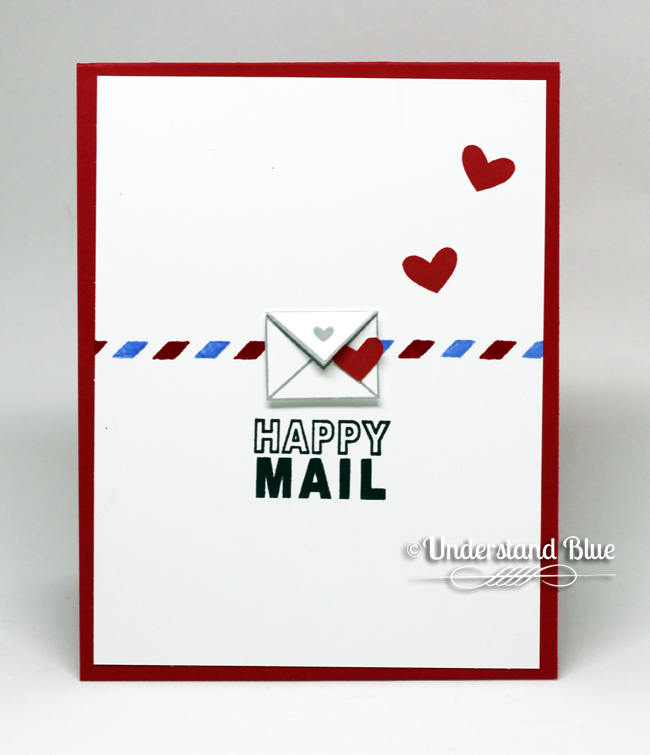 Yes, you are right - stampers do enjoy mail-themed cards! 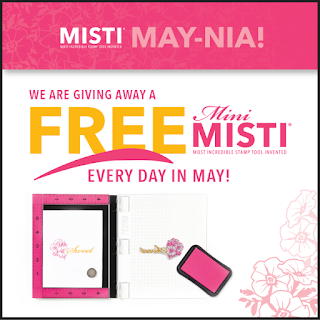 And Happy MISTI May-nia - that's a fabulous giveaway! I had a couple stamps before I started stamping so I have two that are about 12 years old - I still have the stamps somewhere but the brand escapes me. My oldest stamp is only 5 years old. I started stamping after my mom passed away and I couldn't concentrate on longer projects so I began making cards. I haven't stopped yet. A Walk Down Memory Lane...my stamp set (according to a poster on Ebay) is from the 1980's, which is correct. I took my first quilting class in January, 1980, and within probably 6 months, I decided I wanted to make a cat quilt. Pearl's Arts and Crafts was a fav of mine, and I found this set of 6 stamps, by All Night Media Rubber Stamps, named CAT DREAMS. No date on it, tho. Didn't work out for a cat quilt, (too small) but I continued to collect stamps and supplies, and finally started making cards early 2000. My quilting continued to this day, having worked in a Quilt Shop for almost 25 years, and teaching quilting for almost that long. And my love of cats has continued, with 5 gracing my home and my heart at the present time, and many more having lived out their lives with me. My oldest stamps were foam backed from All Night Media. They are probably 16 years old or more. It was a set of stars with the moon. My oldest stamp set would be from Stampin' Up! ... Teeny Tiny Wishes. Got it in 2008. How clever...and cute! Thanks for sharing. My oldest stamps are wood mounted from when Close to My Heart used to be called DOTS! I got them on 2000, and still have them today. Love your card. My oldest stamp is over 30 years old. A "Rachel" stamp I bought for my daughter before she could write her name. She is almost 34. I won't win the oldest stamp. The oldest stamp I own is a wood-mounted stamp from Stampin' Up! called Lovely as a Tree that I bought in 2005 when I was first introduced to this craft. Thanks for the chance to win a Misti. My oldest stamp I could find was of a running horse, but there was no manufacturing id on it. It is a wooden block stamp, and I seldom buy those anymore. Beautiful card....OMG my oldest stamp set is probably a little more than 10 years old! lol...It's a Stampin Up set. My oldest stamp is PSX the code on the side is c-276 "single stemmed rose bud". I think I got it before I graduated high school, so that would be about 1987 or 1988. Love your card. It's so nice & clean, my favorite look. My first stamp I think was a palm tree that I used to make Christmas cards (I live in Southern Calif.). I still use it! That was about 30 years ago (yikes!). I love your card and the video was very informative. My oldest stamps are my mandala stamps by Outlines which I purchased back in 2001 after seeing them on the Carol Duvall show. I found a stamp store near the university my daughter was attending at the time and almost always visited there when I visited her. I love you card--that envelope stamp is too cute! My oldest stamp is a Hero Arts set of Quatros called Leaf Prints from 2000. Cute card! My oldest stamp is a little cactus stamp that I got about 19 years ago. Another stamp set to add to the wish list, so cute. Thanks for sharing. Beautiful card, love the movement with the cute little hearts! My oldest stamp is a Stampin Up set from 2000, it was a floral one. Oldest stamp is a super cute squirrel! I'm a newbie so my oldest stamps are only a little over a year old. And I believe one of my first stamps was Dreams Take Flight by Gina K.
So stinkin' CUTE!!! Thanks for the great inspiration! Love your CAS card! My oldest stamp is a Hero Arts of 4 fall leaves in a row. I purchased it at our local JoAnn's. I had no idea what to do with it but thought I'd learn. That was 17 years ago! Oh goodness....A flowered heart that I used for my sons rehearsal dinner. It is by Embossing Arts and it was ancient history since the marrage didn't last but 5 or 6 years. So sad but now there is a new Mrs. and 5 yes that is five grands. really like this new kit and all of the talent has been showing off for sure. Thanks for your part. What a fun card! My oldest stamp is 20 years old! I can't believe I've been stamping that long! I used to love the old air mail envelopes and that really fine paper. I have maybe 20 year old stamp that was given to me. It's personalized and says This cookbook belongs to the collection of ____me. Very cute card with a very HAPPY vibe! Forgot to include my oldest stamps! Both sets are from 1997 from Hero Arts. "Tiny Backgrounds" and "Tiny Sprinkles". I haven't been able to part with them! Love your card with its simplicity and beauty! Bravo! My oldest stamp dates back to the 1970's. It's a teacher stamp from DOTS, inherited from my husband. I think it says "Outstanding." The Hero Arts set is amazing, and I love your work! Love your card and the video is so helpful. Really can't remember my first stamp but it would be over 15 years ago. I love your blogposts! Hmmm, haven't been stamping that long (not going to count the old "self-inking-party-favour-stamps" I had lol), so I think my first "real" stamp might've been the Lovely as a Tree from Stampin' Up about 7-8 years old now (and still rockin' it!). Great card! My oldest stamp is a little welsh dragon with a plastic handle that i purchase din 1974 it has no manufacturer on it or name. My next oldest is a Real Musgrave pocket Dragon made in 1994 by VIP. He is a cute guy with hands crossed looking up. My oldest stamps are mid 90's. Some foam stamps from Stampin' Up, I scored at a church yard sale. Happy mail, indeed! I would love a misti, but I don't think my stamps are as old as some of the other commenters'! I love your card with traditional colors. It screams "mail me!". I have lots of old stamps, as I have been stamping since 1969. One of my favorites is from 1992 - Inkadinkado. I don't keep them all, but this is a keeper. Love the little envelope on your card! My oldest stamps are from the early 90's - probably about 1993. I worked in an elementary school and there was a guy who came around regularly selling stamps to the teachers. Love your ideas. Oldest stamps are probably Christmas foam stamps back when I made my own paper. Really like your card. Simple, yet colorful. My oldest stamp is Heartfelt from Stampin' Up that I got in 2006. Pretty card! My first stamp was a Stampin' Up set called Little Layers. I think it is about 12 years old. I love this card, it is wonderful! I think the oldest stamp I have in my collection is a set call Scouts at Play by Stampin' Up. I bought it when my son was in Cub Scouts years ago. I know that I have some Stampin Up stamps that are from 2006 because I saw the copyright date on them as I was cleaning them the other day. The oldest stamp still in my collection is dated 1986 and is a sand dollar design from All Night Media. That makes it 30 years old and I still use it sometimes. I started stamping back in the late 90's, and first did cards and simple scrapbooking. I was introduced to Stampin' Up!, and while waiting for my first order I bought a wooden stamp at JoAnn's. I still have it - it's a little flower stamp called "Ribbon Daisies" by Stampendous. I bought it probably in '98 or '99. My oldest stamp is stampin up's Equestrian Dream - 2001. That is my favorite syamp, too! Love your card and the kit! I love my Misti and would love to have the mini! Great card. My oldest stamp is one my mom had which is over 25 years old! It is a psx bear stamp. Your postal themed card is so cute. My first stamp set was a set of sentiments from DOTS, which is no longer in business any more. I still use them occasionally. I love this card kit and your card is just adorable!! I really love your happy mail card! My oldest stamps are from about 1996. They are foam stamps and were advertised on Aleene's Creative Living Craft show if anyone remembers those. My oldest stamp is from All Night Media. I bought it about 20 years ago from a little kiosk at my local shopping mall. They should have told me it was the start of my new addiction! Very cute! Thanks for sharing and for the chance to win a Mini MISTI! I've been stamping for 22 years and my oldest stamp is an angel that I bought to make Christmas cards. Love the CAS card - I don't think I know how to make any other kind! My oldest stamp set is from SU - I don't remember the name of it, but it was from my very 1st stamp club (1999, I think? ), so that would make it 16+ years old. Wow - makes me feel kind of old!